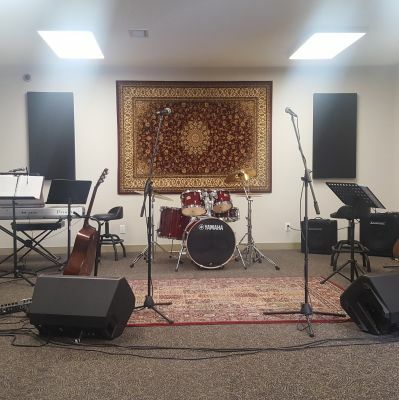 SoundLab has 9 highly soundproofed and acoustically treated rehearsal rooms. Each room is equipped with PA, SHURE SM58 mics and stands, drum kit, guitar stands and music stands. Keyboards, amps and stage lights are available for a small rental fee. Recording gear is also available for rental. Our 1500 sq ft event space is rectangular with great sight lines. The raised stage is modular can be configured in various ways based on 4'x4' sections.